"We spent several months in planning to enlarge our patio and landscape the back yard. We received plans and cost estimates from several landscapers. The message was simple: This is what we will do at this price take it or leave it. 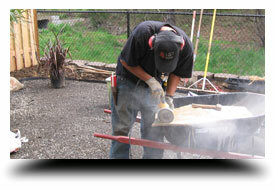 We have never had second thoughts about choosing Twin Oaks Landscape services. Colby was willing to spend time with us at each stage of the project. 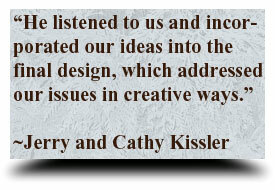 He listened to us and incorporated our ideas into the final design, which addressed our issues in creative ways. For example, Colby Kraxberger (from Twin Oaks) and Will Sutterneld (from Devine Concrete) developed a cost effective plan for expanding our patio, which was much better than the other proposals we had received. Colby&apos;s excellent landscaping plan for our sloping yard has a sense of proportion and balance. His choices of flagstone for the ribbon around the patio and the plants for the yard were tasteful and will lead to hours of enjoyment during each of the seasons. And, we are very pleased with the water feature and the lighting. Colby was everything that we had hoped for in a landscaper. He did an exceptional job, paying attention to every detail with an excellent sense of proportion and design. And, he was here every day to supervise the workers. 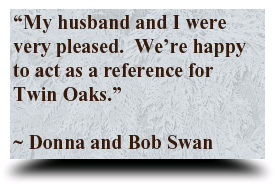 As a result we have no hesitation in recommending Twin Oaks Landscape services." "I can confirm that they have excellent integrity and work ethics. The owners and staff are some of the most courteous people I have dealt with." "I plan to hire them again for the final phase of my landscape renovation sometime in the future. I can recommend them to any prospective client without reservation." "They came up with a beautiful design that complemented the style of my home and the unique physical features of my lot."